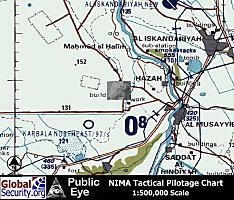 Musayyib is a sleepy provincial town located some 70 kilometers south of Baghdad. Populated mainly by Shi'a Muslims, there was no resistance to the presence of coalition troops. Residents of Musayyib say they were hoping the fall of Saddam Hussein would bring new resources to their shabby, rustic town. But more than seven months later, the streets of Musayyib remain unpaved, hospitals and schools are badly in need of repair, and local police are scarce and ineffective. Tens of thousands of Iraqis disappeared during Saddam Hussein's three decades in power and were presumed to have been executed or imprisoned. With mass graves being discovered and excavated, the fate of those who disappeared may finally be learned. In southern and central Iraq, unknown tens of thousands of Shi'a disappeared in the reprisals following their 1991 rebellion against the government. Mass grave discoveries in Hillah and Musayyib alone have turned up about 3,500 suspected Shi'a victims. During the 1980s manufacture of machinery and transport equipment accounted for only 6 percent of output value, and value added was fairly low, suggesting that Iraq was assembling imported intermediate components to make finished products. A single factory established in the 1980s with Soviet assistance and located at Al Musayyib, produced tractors. 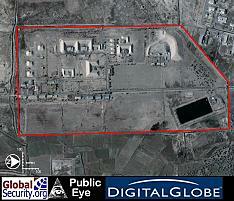 The Iraqi nuclear weapons effort, which was directed from the PC-3 headquarters received raw uranium for processing from mines at Ukashat. Seven facilities were promiment in the calutron enrichment program. 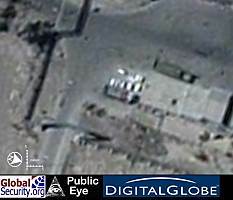 Four of these facilities, al-Jesira, al-Atheer and al-Rabbiyah and al-Dijjla at Zafaraniyah, had not been identified by American intelligence as being associated with the nuclear weapons program and consequently escaped any significant damage from coalition airstrikes during the Gulf War. 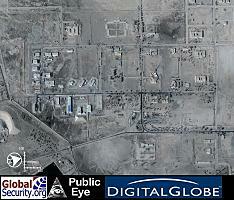 The Iraqis expected the al-Atheer site to be bombed and moved materials from the facility during the War. 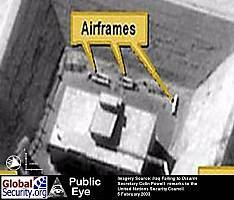 The three other facilities -- Tuwaitha, Tarmiya, and al-Fajar -- were previoiusly identified by American intelligence as being associated with the nuclear weapons program and suffered extensive damage during the War. Another program for the production of uranium under the Petrochemical-3 project used gas centrifuge enrichment, with two facilities at Al Furat and Rashidiya, and a third under construction at Taji. 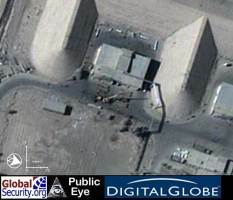 Al Atheer Center, located 68 km SW of Baghdad at al-Musayin near al-Musayyib [Al Musayyib], was designed and constructed as the major facility for nuclear weapons development, testing and production. 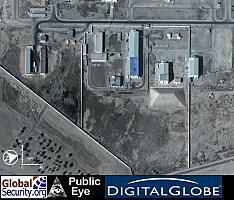 The Al Atheer site was principally involved in nuclear weapons design activities to service the weaponization program, as well as functioning as a materials production center. The PC-3's al-Atheer plant included hydrodynamic high explosives tests for developing a nuclear weapons design. Activities at the site were included: uranium casting and metallurgy, core assembly, explosive lens assembly, and detonics testing. A high explosives test bunker near the site was used for hydrodynamic experiments. Eight buildings at the Al Atheer/Al Hateen site covered an area of approximately 35,000 square meters. 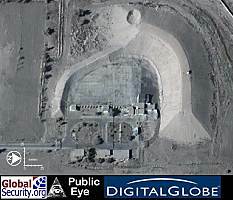 After repeated visits, nuclear weapons experts on the IAEA inspection team became convinced that it was the Al Atheer site that was principally involved in nuclear weapons design activities. 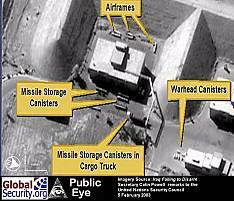 Iraq maintained that it was a materials production center until 21 October 1991 when it admitted that the site had in fact been built also to service the weaponization program. 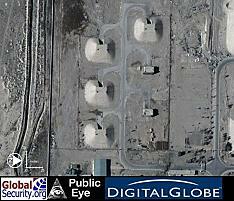 The large nuclear weapons related buildings and bunkers were destroyed under IAEA/UNSCOM supervision in summer 1992. On 13 December 2002 an UNMOVIC team of 14 inspectors visited the Al-Mussayib Pesticide Store, which sells ready-to-use pesticides. 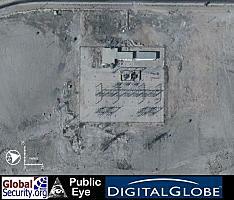 The Iraqi Foreign Ministry did not comment on the inspection of this site. But, UNMOVIC reported, "On request, the National Monitoring Directorate brought two facility representatives with keys to all buildings and rooms." The Iraqi Foreign Ministry reported that an IAEA team of three inspectors took water, grass, and mud samples in the town of Al-Swaira, near the Al-Swaira Bridge on the Tigris River, as well as the Al-Kaed River and in the town of Al-Mussayib near the "new bridge" on the Euphrates River. 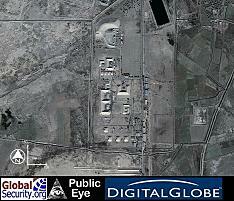 The Iraqi National Monitoring Directorate took samples at the same time "for a reference in case of need." The IAEA confirmed that its inspectors took water, sediment, and vegetation samples at "three Major Iraq Surface Water Drainage Basins of the Tigris and Euphrates rivers" south of the 33rd parallel. Abu Ishaq al-Mu'tasim ibn Harun (794 - January 5, 842) was an Abbasid caliph who reigned from 833 until 842). He succeeded his half-brother al-Ma'mun. The ghilman (sing., ghulam) were introduced to the Caliphate during al-Mu'tasim's reign. The ghilman were slave-soldiers taken as children from conquered regions, in anticipation of the Ottoman devshirme system, and made into soldiers. The ghilman, personally responsible only to the Caliph, were to revolt during the reign of al-Radi. 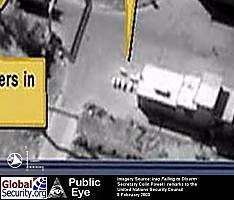 On 21 February 2003 a team of two UNMOVIC missile inspectors visited the Al-Musayyib Electricity Station to inspect fuel tanks used for operating the station, the Iraqi Foreign Ministry stated. UNMOVIC stated that the purpose of the inspection was to ascertain whether missile-related items were stored there. 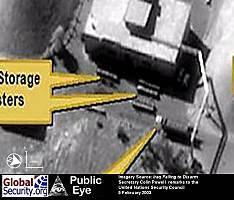 Fifty-five UNMOVIC and IAEA inspectors visited 13 sites on 16 December 2002, according to a statement by the Iraqi Foreign Ministry. One group visited the Al-Musayyib Ammunition Store to inspect 81-millimeter rockets. The Foreign Ministry said the rockets "have a range of 10 km and are fired from rocket launchers" made from aluminum pipes manufactured by the Hittin State Company. 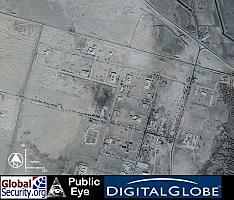 A reported 48 inspectors visited six sites on 26 December 2002, according to the Iraqi Foreign Ministry. A team of 16 chemical inspectors visited the "petrochemical project" belonging to the Public Industry Consultation and Design Commission of the Ministry of Industry and Minerals, according to the ministry. Inspectors met with "specialists" at the site and asked about changes made since 1998, as well as the reasons for the cessation of new construction at the site and future plans, the ministry reported. 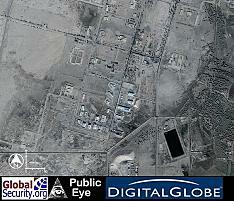 Inspectors also toured the site, located 60 kilometers south of Baghdad, and checked equipment against declarations. UNMOVIC reported the name of the plant as the Musayyib Pharmaceutical Complex and noted that it was under construction in 1998 and remains so. 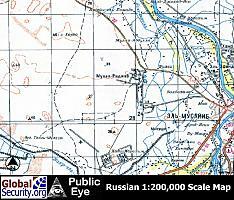 On on 10 February 2003 a joint UNMOVIC team of 10 inspectors visited the Al-Musayyib Ammunition Depot, located in the province of Al-Musayyib (Babil Governorate). Inspectors questioned the site custodian about the number of warehouses and the number of new buildings at the site, as well as the types of ammunition stored there, the Iraqi Foreign Ministry stated. 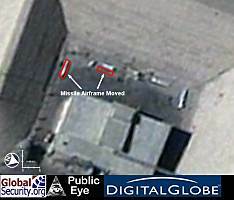 Inspectors reportedly searched the warehouses using chemical sensors and X-ray devices and collected samples from an 81-millimeter missile, the ministry added. Al Atheer and Al Musayyib were merged into the the Motassim company which was part of the al Rashid State Establishment. 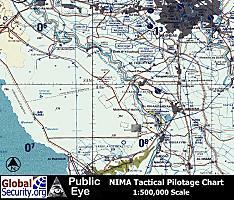 NIMA map with satellite image insert showing Al Atheer located near town of Al Musayyib. The Al Atheer/ Al Musayyib Facility occupies over 1,100 acres and is divided into two areas: the smaller solid missile plant, which is 200 acres in size, and the former Al Atheer research and development lab, which covers over 970 acres. Overview of the research and development area. Overview of the 81 mm rocket assembly area. North-orientation of the solid rocket testing area. 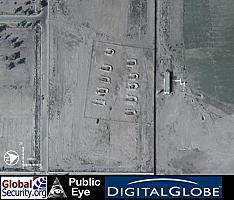 Eight revetted buildings associated with solid rocket motor testing are visible in this image. A large revetted test area. The crater at the top is probably from the first Gulf War. 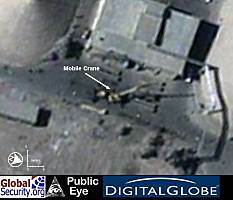 On 10 November 2002, a cargo truck is visible. Rocket propellant storage igloos. Two of the buildings on the right are incomplete. Overview of the Al Atheer (later the Motassim company). 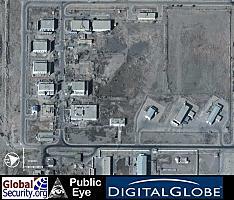 This area used to be a part of the Al Atheer R& D center, and was more recently used to assemble 81 mm rockets. 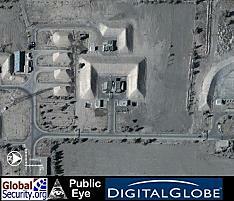 The buildings with concrete partitions, are associated with the 81 mm rocket assembly. An earth-covered revetment indcating an association with explosives or rocket motors. Oil drums, possibly for obscuring the facility with smoke from oil fires.